Application: Petrochemical & Chemical Industries,Fertilizers,Textiles,Steel Plants,Paper Mills,etc. With the support of our professionals, we are involved in offering best quality of Camlock Couplings. The offered Camlock Couplings are extensively used to rapidly connect and disconnect fitting on piping or hose and in many other suitable applications. One can avail these products form us at market leading price. Our company is engaged in the manufacture, supply and the export of a high quality of Camlock Coupling which have been made using a high quality of raw materials procured from well known vendors in the market and they offer tight and leak proof connections to the tanks, pipes and hoses and they are rust proof in their nature. Our range of quick release couplings are designed to make life easier for operators who need to connect and disconnect equipment quickly and easily. We stock popular ranges such as ISO A, ISO B, Flat Face, Screw Type, trailer break and tipper couplings up to 700bar to name just a few. They are available in both mild and stainless steel. Mild Steel Chromium Palted Brass, S.S. 304 & S.S. 316. Fertilizers, Chemicals, Petroleum, Textile Machines Pharmaceuticals, Port Trusts and Dockyards, Dairy Food Processing, Brewing, Ink, Paint & Varnishes Dyes Etc. Industries. With the support of our professionals, we are involved in offering best quality of IC Fittings (Camlock Couplings). 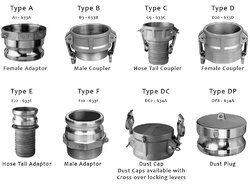 The offered IC Fittings (Camlock Couplings) are extensively used to rapidly connect and disconnect fitting on piping or hose and in many other suitable applications. One can avail these products form us at market leading price. We are the leading manufacturers of Camlock Coupling and related products. Solid Bar Stock of Mild Steel, Brass, S.S.304, S.S.316 & Aluminum Castings of Carbon Steel Gunmetal & Bronze or as per Customers Requirements. Nitrite, Viton, Neoprene, Silicon, Hypalon etc.